Interview mit Koen Rotteveel zum Thema Multitouch | Zukunftswerkstatt Kultur- und Wissensvermittlung e.V. Im Zuge der Vorbereitung für den Bibliothekartag in Berlin war es mir möglich ein Interview mit Koen Rotteveel vom „DOK, the Library Concept Center“ in Delft über die neusten Entwicklungen des DOK im Bereich der Multitouch-Systeme zu führen. Wir freuen uns sehr, dass Koen zu uns nach Berlin kommen wird, um uns in einem Vortrag (Mi. 08.06.2011 um 11:30 – 12:00) über die aktuellen Entwicklungen zu berichten. Wenn Sie also nach dem lesen dieses Interviews neugierig geworden sind auf diese neuen Möglichkeiten der Informationsvermittlung in Bibliotheken, besuchen Sie uns im Raum Paris auf dem Bibliothekartag! We are here in Delft, the Netherlands, where DOK, the Library Concept Center, has been working on digital storytelling tools for libraries and museums for a number of years now and have come up with new applications for Multitouch that allow the users to bring their own content to the library. With us is Koen Rotteveel, Interaction Designer and Developer, who is currently working on designing multitouch applications for the Microsoft Surface. Julia Bergmann: Hello Koen, nice to have you with us. Could you tell us a little bit more about you and your work at the Library Concept Center? I always found interaction design very interesting. It is so great to design applications that are really working and add that extra experience to the library visitors. DOK Library Concept Center is like a large “spielplatz” for me. I can design an application or product and immediately test it in the library. I can watch from a small distance and see how the visitors are experiencing it. After a few days of testing I can rework the product and by these small iterative steps I can elaborate an idea into a good working product. Julia Bergmann: The Library Concept Center now exists for a couple of years. In IT-terms this is quite a long time. So let us talk a little bit about its history, especially in connection with multitouch applications. When did the Center start to work on it and how has it developed since? Koen Rotteveel: Actually I think we were one of the first public institutes in the Netherlands that had the possibility to use a multitouch table, I think that was about 2 years ago. One of the projects that we were working on back then was the Heritage Browser, which was based on my graduation idea. In this application the library visitors at DOK can put their library membership card on the multitouch table and, by reading it’s zip code, it will show them images from as far back as 1910 of their own street out of our local archive. Since then we designed and built multiple other multitouch applications, e.g. for the Rotterdam Historic Museum and the Touristic Information Point. Julia Bergmann: So, in your opinion, what are the most interesting features of multitouch? What are the new possibilities, especially in connection with library services? Koen Rotteveel: Multitouch is so great because it always allows more than one person to work together. We see libraries are more and more a place for sharing stories and multitouch is a great tool in helping people to share their stories. 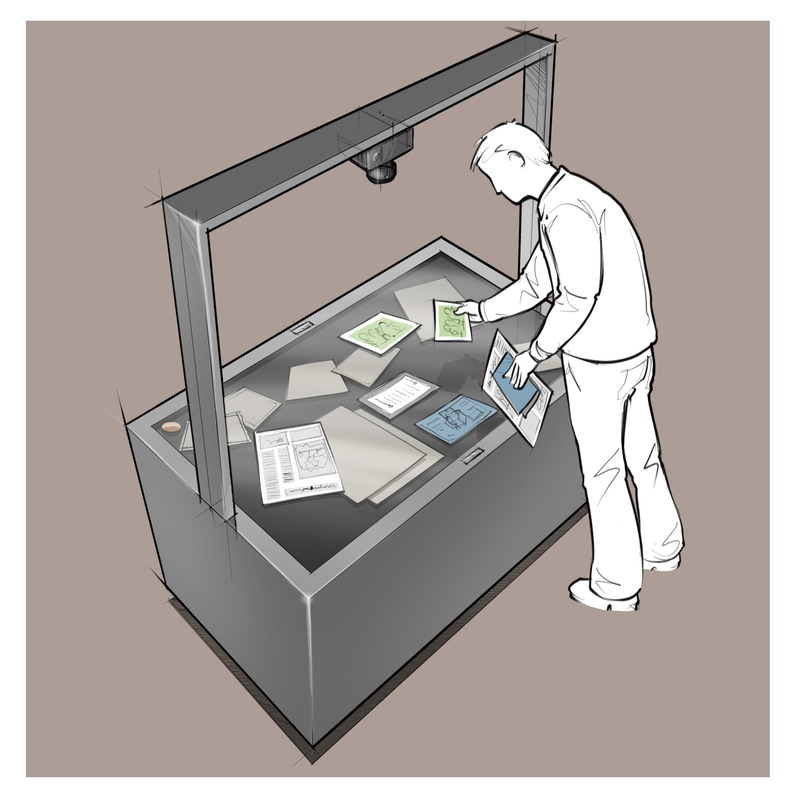 We see a lot of people browsing through the archive on the multitouch table together and sharing their stories, without them even knowing each other. Another great thing about multitouch is that it is very easy to use, because it doesn’t look like a computer. We also see a lot of elderly using it without any problems. At first they are a bit hesitant to use it, because still it looks pretty modern, but after a while they see how easy it works and we even see people without any computer experience working on it. Finally a great feature of some multitouch tables is the ability to recognize objects. This makes it great to create a connection between your physical and virtual collection. It can also be an interesting add-on that will attract people to the table. 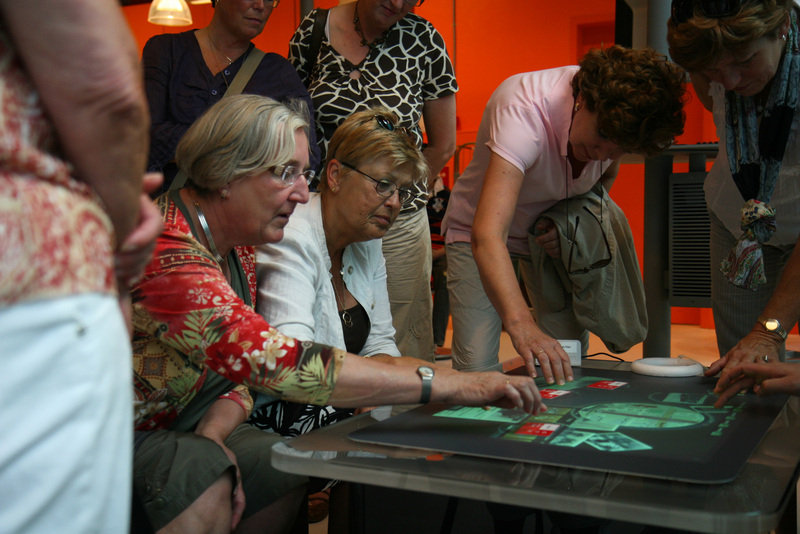 For instance for the Historical Museum Rotterdam we created real wooden stamps that people could use on the table to ‘tag’ the virtual images on the screen. At the moment we are investigating ways, in which we can use the object recognition part to create more inspiring applications for libraries. Julia Bergmann: So now we have talked about existing features. Can you perhaps give us also an idea about the future prospects of multitouch applications? 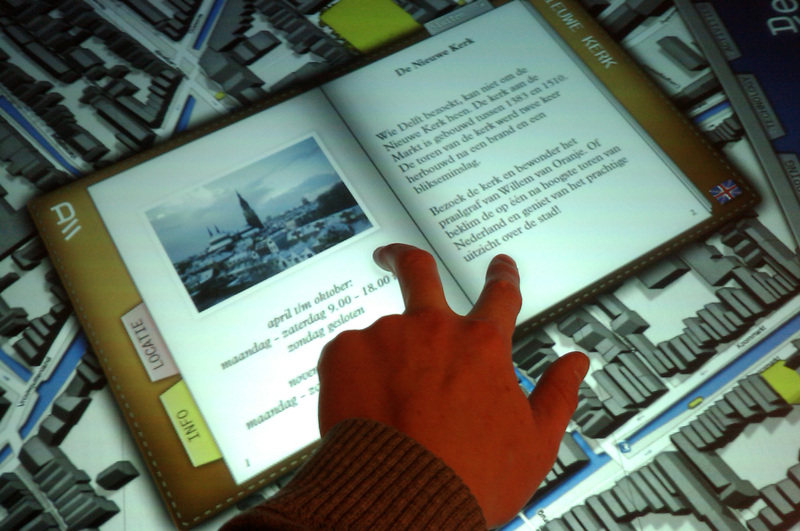 For the Dutch library organization ‘Bibliotheek.nl’ we are working on a future enhancement for multitouch tables. 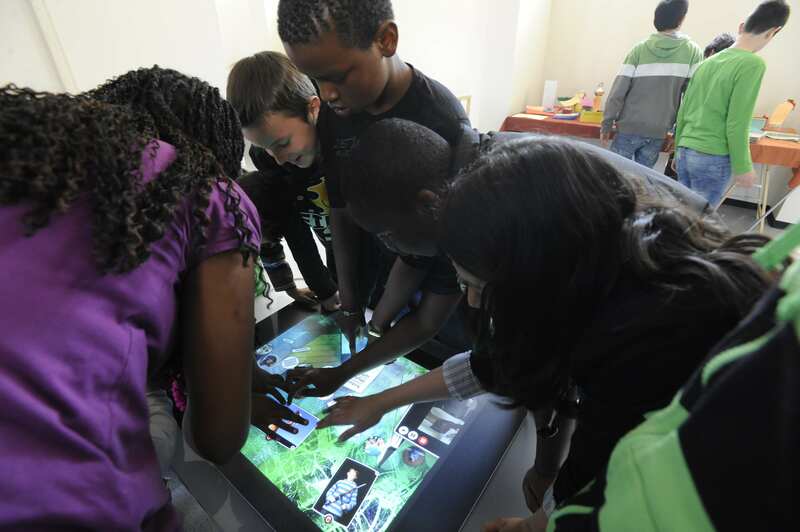 We see many possibilities for not only using the multitouch table as a tool to provide content to the visitors, but also as a tool to have people add their own content as well. Multitouch is a really great tool for output, but very difficult for input. 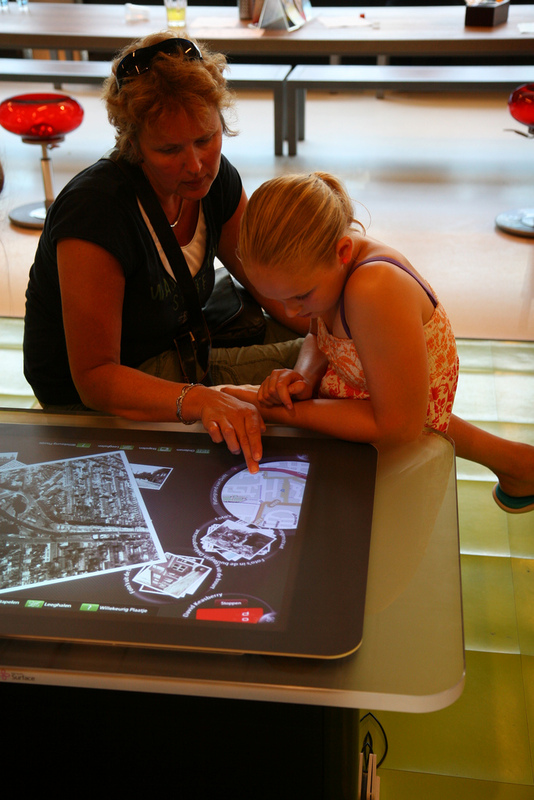 During the project, which is called ‘Project P’, we designed solutions so people can just place a photo, bookpage, newspaper article or anything else they want to share on the multitouch table surface and it is added almost immediately to the collection. Furthermore we have created a tool so people can write something on the screen using a special pen, which is then automatically translated to real text, using handwriting recognition. But not only technical innovations are important here, at the same time we are doing focus group research and trends and needs analysis to see if people are willing to share stories and how they would like to do that. Julia Bergmann: Now, of course the Library Concept Center is spearheading library developments. But nowadays innovations like multitouch applications are or at least should be a big issue for every library to keep in touch with its existing or potential customers. So could you tell us a little bit about how the Library Concept Center cultivates or gives room to innovative ideas and perhaps how a normal library could implement similar (or, of course, different) ways to develop and manage innovation? Koen Rotteveel: OK, the Library concept center has since it has been established in 2006 always seen the need to innovate in order to be a model to other libraries and to stay relevant in the community. In the first years Jaap van de Geer and Erik Boekesteijn, my colleagues at DOKLAB, traveled around the world on their Shanachietours to seek best practice and find the needs and demands of libraries and customers. 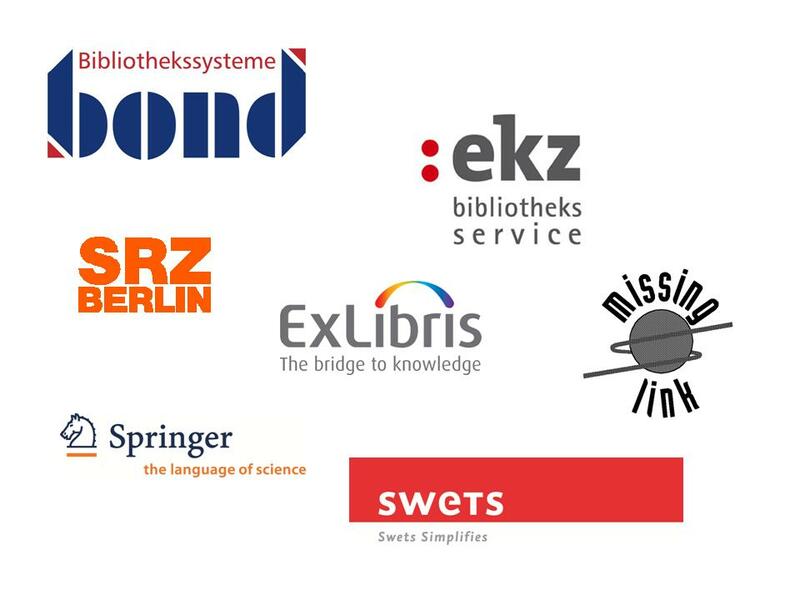 The lessons learned have been an input to many projects carried out in DOK and other libraries. The libraries that will survive in our view are the libraries that are most adaptable to change. This means that the size and budget of the libraries are not as important as the mindset. Choices were made in DOK and choices will have to be made elsewhere to make sure that budget is created and guaranteed to learn and innovate and make sure there is a library future. To keep libraries up to date and to help them make decisions, librarians can watch This Week in Libraries. DOKLAB is hired on a regular basis for consultancy by other libraries, but also by architects such as Mecanoo and Zaha Hadid, and our advice is to inform yourself well and work together with capable partners instead of trying to invent the wheel over again and again as we say here in the Netherlands. This saves time and money. Julia Bergmann:Thank you very much for this illustrative interview! Wir danken Koen Rotteveel und dem DOK herzlich für dieses Interview und das zur Verfügung gestellte Bildmaterial und freuen uns, sowohl Koen als auch seine Kollegen Jaap van de Geer and Erik Boekesteijn mit ihrer Show „This Week in Libraries“ (Mi. 08.06.2011, 15:00 – 16:00 h) in Berlin begrüßen zu dürfen. Sie finden die Zukunftswerkstatt und unsere Gäste im Raum Paris. Wir heißen Sie herzlich Willkommen! Ein besonderer Dank gilt auch der StadtBibliothek Köln für ihre Unterstützung. Entry filed under: Best Practice, Bibliotheken, Forschung, Interview, Veranstaltungen.